The 73-year-old mind of Masaaki Imai runs razor sharp belying the frailty of his small frame. He talks with sincere conviction, pausing to select the right words. He has to be careful, after all, his words have been changing the way the corporate world talks, and more important, acts. When he first threw the word ‘Kaizen’ at the corporate world through his book Kaizen: The Key to Japan’s [ Images ] Competitive Success in 1986, it was swallowed hungrily by a world in the throes of transition. Translated in fourteen languages, Kaizen became a fad the world over. Toyota [ Images ], the outstandingly successful Japanese carmaker, became one of his most committed followers. However, Imai, the founder of a leading international management and executive recruiting firm, and consultant to over two hundred companies, realized that the concept had neither been digested nor well implemented. He introduced an evolved form of Kaizen in 1997 in his book Gemba Kaizen: A Commonsense, Low-Cost Approach to Management, to reassert the importance of the shop floor in bringing about continual improvement in an organization. Today, the father of ‘Kaizen’ and ‘Gemba Kaizen’ is convinced that to survive in an increasingly competitive world, top management must adopt a just-in-time approach and drive change down the hierarchy without yielding to resistance. Forget forecasting, concentrate instead on crashing the time taken to execute orders. According to Imai, 90 per cent of all corporate problems can be solved using common sense and improving quality while reducing cost through the elimination of waste is the only option for survival. Kaizen is about constant continual improvement but in today’s world, are small improvements enough? What if you need to make big, radical changes? Kaizen is the means to achieve a corporate strategy, not the strategy. Every corporation needs to make a radical change, or some change at least, to survive in this very competitive, rapidly changing world. The most important challenge facing top management today, especially in a manufacturing company, is to establish a target about where they want to take the company in the next two, five and ten years. In manufacturing, there are only two systems. One is the batch or queue production system, and the other is what we call just-in-time (JIT) or the Toyota production system. One of the most urgent tasks for top management is to choose the strategy, and say that we have decided to change to the just-in-time production system to be able to survive in the new millennium. Kaizen is misunderstood by most people. They say Kaizen is small step improvement and this is the age of big jumps, but in my way of thinking, the biggest jump is making the transformation from the batch mode to JIT. Why should companies move away from the batch mode to just-in-time? The batch production system, to which almost 99.9 per cent of all manufacturing companies subscribe, is destined to perish. It is the most inefficient way to make products. It is prone to all kind of shortcomings: it is almost impossible to build quality in a product and it defeats the purpose of making products at low cost. It also makes it very difficult to meet customer requirements, which come in different orders, like different volumes in different time frames and so on. On the other hand, JIT production system is the opposite of the batch system. The batch system derives from the agricultural mentality. When the industrial revolution took place in the nineteenth century, managers adopted the pattern of production from agriculture: first you sow seeds, then harvest and store. The more wheat you had, the more secure you were, so everything was made in big batches. Similarly, in the batch system, you purchase material and produce in big batches and there are many processes. At every process, you accumulate the batch and at the end you accumulate the finished product in a batch, which is stored in the warehouse. Which is very efficient, offers standardization. . . This kind of production system is based on market forecast. You say, this year we will sell half a million cars, so you plan according to that and start making half a million cars. What happens if your forecast is wrong and you manage to sell only quarter million cars? You are left with quarter million cars unsold and a chunk of cost — labour, raw material, etc — is in it. What are you going to do? You think it is the most efficient production system? Batch system is good when there is demand. As a company begins to acquire the capacity to produce faster and faster and more and more, eventually there will come a time when its production capacity goes above what the market can bear. Today, several Japanese electronic companies are in big difficulty. What do you think happened to these companies? These are the companies that didn’t know that they should have introduced JIT. Most of the electronic companies have a production system based on assumption of the market and market forecast. The same thing happens in the computer chip industry. You end up with huge inventory of unsold products and excess capacity, then you borrow money to carry that inventory. By that time you have acquired too many people for every process. Do you think that is a very efficient way of making a product? Eventually the company will have to restructure or go bankrupt. And what is the solution? Just-in-time. The starting point of JIT is to pull from the market. The market should always come first and production later. How long would the customer have to wait for the product? In some cases, only a few hours. In the case of a car, maybe a few days. But it is a competitive market, why would a customer wait? There are lots of car manufacturers, there is lots of choice, I can walk into any showroom and buy a car. Why should I wait? 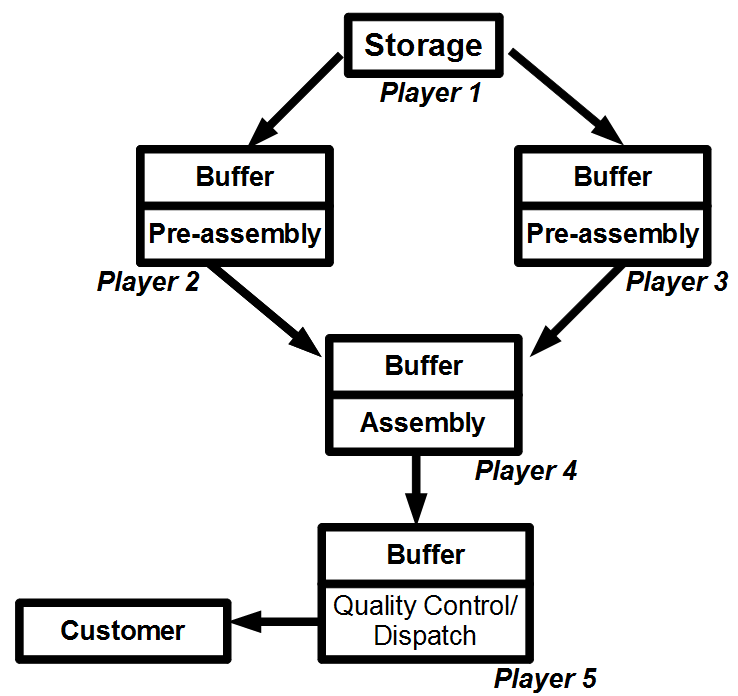 In batch system, the company has to anticipate that the customer will request this kind of a model. Right? And it will have to build an inventory of this kind of car, but they don’t know how many orders are coming. They have to have so many cars waiting for your order to arrive, which is very inefficient. The customer may not know that she wants a product. The inventor has to estimate the market for it. It is the role of marketing to define the product and the role of production to make the product. Well, I think it is the other way round. The role of marketing is to dig out the potential or hidden requirement that the market has. You don’t follow the product out approach but first find the need of the market and then make the product. If you don’t have technology, you have to develop it and if you don’t have the machinery for such a product, you have to design it. Managers today are obsessed by a ‘growth’ mentality? Do you think growth is a smart strategy? I can say that 99.9 per cent of all companies in the world today are obsessed by a growth mentality. These are companies that can make profits only when the market is growing. In real life, market demand always fluctuates. The only companies that will survive in to the next millennium will be the ones that have the flexibility to produce according to fluctuating demand. I read that Kaizen works most effectively in the time of crisis. Why? During a crisis, everyone understands the urgency of the situation. The transformation of the production system is a massive physical operation, like operating on the bone structure itself, which is why it is very important that top management be committed to make such a transformation. That is the only way to survive in the new millennium because it is the most effective way of making a product. It also increases your cash flow immediately, so when companies are faced with crisis, it is the best time to introduce Kaizen. For instance, in India, there are many situations emerging, like China exporting products far below the cost price. In this age of global supply chain management, being the best in India is not enough, you have to be the best in the world. Do you have a Kaizen institute in China? What makes China so efficient? No, we don’t have an institute in China. What makes China superior is its labour cost, which is 1/50th of Japan’s labour cost. But lower labor cost does not equal efficiency. What makes China so efficient? I wouldn’t call the country very efficient. They can produce a certain product, particularly consumer-related products, at a lower cost in mass production because so far many western and Japanese companies have transferred technical know-how to them. China has acquired the basic production capacity. Earlier the same thing happened with Malaysia, Korea, Taiwan. Today it is China’s turn. What happened was that Japanese, American and European people have transplanted technology, they hired local people and brought machines there and trained them to do the job. So that’s how they can produce. So, would you call China a superior manufacturer? Not superior, but they can produce at a far more competitive price. Superior has many connotations, in terms of design, efficiency, etc. I certainly wouldn’t call China superior. They also have efficient processes. . . But so far, those processes have been given to them from Japan and the western world. The price of labour is cheaper in China, but would the productivity of a Japanese worker be higher than that of a Chinese worker? I am talking about labour cost. Of course, you have to make quality products and in order to make quality products, you must have quality conscious employees. How do you develop quality conscious employees? Most Japanese companies when they went to China had a hard time training them, the people didn’t have quality consciousness. The Japanese spent a lot of time selecting the right people and training them in production procedures. So this kind of training has been provided along with some basic principles of quality assurance. These managerial practices can be transferred, but you see in China, they are paying the equivalent of one Japanese worker’s wages to fifty people. Quality control has been introduced and can be exported in any country. Japan was at its peak in the 1980s but now China is far ahead, does this suggest that the Japanese model is invalid? We need to distinguish between external circumstances (social, cultural and political infrastructure) and internal circumstances (like how business is conducted within the company). The recent negative reports about Japan relate to the external circumstances, such as governmental regulations, overprotected market in some sectors, aging society and the Big Bang needed by the monetary institutions. There is a realisation that Japan Inc may not be functioning as efficiently as it used to. This in no way means that Japanese management practices (internal management of the company) have proven to be inferior. The Japanese companies developed a very effective system of management, particularly in the manufacturing sectors, and the rest of the world has much to learn from these practices. What are your views about management practices in the Indian corporate sector? I see that Indian managers are extremely intelligent. They are abreast with latest technologies and developments. But the problem is that they completely isolate themselves from reality. They are under the impression that real knowledge can be gained only by reading books and attending lectures. How often do they actually roll up their sleeves and get into some action? They really need to make more effort [at getting into the thick of action]. They have immense knowledge, but what they lack is wisdom that comes by doing things yourself. Published with the kind permission of The Smart Manager, India’s first bi-monthly management magazine.